Dutch MPs voted on Tuesday to strip dual nationals of their Dutch citizenship if they join terror groups such as the so-called Islamic State group to fight as jihadists, officials said. 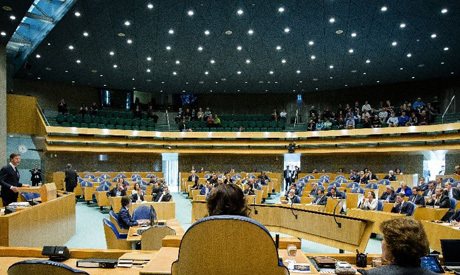 The lower house of parliament approved the controversial bill to revoke the Dutch citizenship of people with dual nationality, if they are deemed to have joined foreign terror groups like IS or Al-Qaeda -- even if they have not been convicted of any crime. The Dutch decision is the latest move as countries across the globe grapple with the problem of how to deal with Islamists leaving to join groups like IS, which boasts between 27,000 and 31,000 foreign fighters from 86 countries, according to a report released in December by the New York-based Soufan security think-tank. It also comes as French President Francois Hollande has back-peddled on constitutional reforms which included plans to strip convicted terrorists of their French nationality, sparking a fierce debate over the risk that it would create stateless persons. "These jihadists can pose a threat to national security when they return to the Netherlands," the Dutch justice ministry said in a statement. The bill now has to go to the upper house in the coming weeks for a final thumbs-up before becoming law. The ruling would not apply however to those people who only have Dutch nationality, Alkema added. Under international conventions, countries are not allowed to intentionally make people stateless. "The scrapping of Dutch nationality becomes possible as soon as somebody in a foreign country joins a group on a list of terror organisations" such as IS or Al-Qaeda, the justice ministry statement said. Any decision to scrap nationality can however be challenged before a Dutch court -- and should it rule in favour of the decision, "it can always be appealed before the Council of State," the Netherlands' highest administrative court, the ministry said. According to past estimates by the Dutch secret services, 200 people from the Netherlands including 50 women have joined IS in Syria and Iraq.